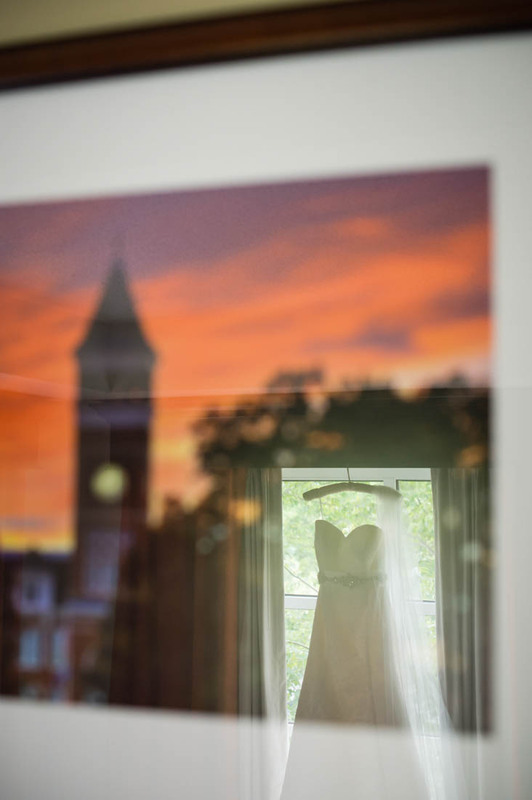 Reflecting in a framed photo of Tillman Hall at Clemson University, the brides alma mater, her wedding dress hangs softly on the window frame. This wedding was held at the Madren Conference Center in Clemson South Carolina which is just a hop and a skip away from our home base, Greenville South Carolina. This was a fun wedding to shoot because my husband and other photographer in Sposa Bella Photography, Craig Mahaffey, works at Clemson University. Being in his element was fun to see all the people he knew around us and more people I got to meet. The wedding was very pretty being right on Hartwell Lake in the greenery of the Madren Golf corse. This picture was taken while getting ready, their was a picture of Tillman Hall of Clemson University and you could see the reflection of the brides dress in the picture. I loved the colors in the picture as well, really made the dress stand out.